There are so many horse riding outfitters in Costa Rica but none of them are getting the same kind of attention that Horse Trek Monteverde is attracting! It is number one on TripAdvisor for things to do in Monteverde. Although one cannot count on it staying at number one forever (as positions tend to change around) it is still an achievement for a horse riding company to be highly ranked over other activities. 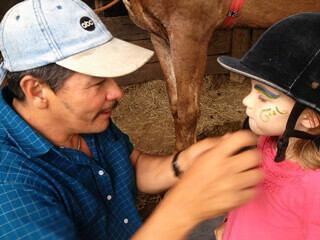 So why is Horse Trek Monteverde so special? What rides do they do? Horse Trek Monteverde has worked hard to raise the standards of care and quality of horseback riding tours in this area, reflected in their numerous good comments on TripAdvisor. The horses are given the best care and treated with respect and kindness. Marvin does everything himself in terms of shoeing, giving medicines /vitamins/worming and other products necessary for the care of horses in the tropics. He also does all his own training and most of the horses can be ridden with one finger on the controls! 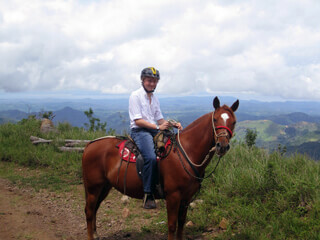 Safety is a priority for Horse Trek Monteverde and helmets are provided and tours fully insured. The short tours are along the lesser used back roads in Monteverde and although cars do occasionally pass, the horses tend to ignore them. When possible Marvin tries to go off road but it is harder these days with the increased use of motorized vehicles in Costa Rica. In any case it does not take away from the fantastic views of the Monteverde area. Marvin will stop when if he sees sloths, birds or other animals. He has eagle-eyes! What makes Horse Trek Monteverde special is the quality of the horses and the spectacular scenery on the tours. Marvin does not want people to simply just ride head to tail and never learn how to ride, he wants people to enjoy the experience of actually being in control of their horse, and throughout the ride he will encourage people to ride better. He also tends to give impromptu Spanish classes! There is no doubt that anyone who gets to see his ‘show’ back at the house loves this part of the tour. Marvin demonstrates his famous horse Gladiator, who does tricks and is a very noble horse. However, this can never be promised as part of the tour in case it is raining or Gladiator is not fit or there is no time. Sometime Gladiator is simply not in the mood! Tours available vary from 2.5 hours and All Day Cowboy Rides to multi-day riding vacations (2, 3, 5 and 8 days).